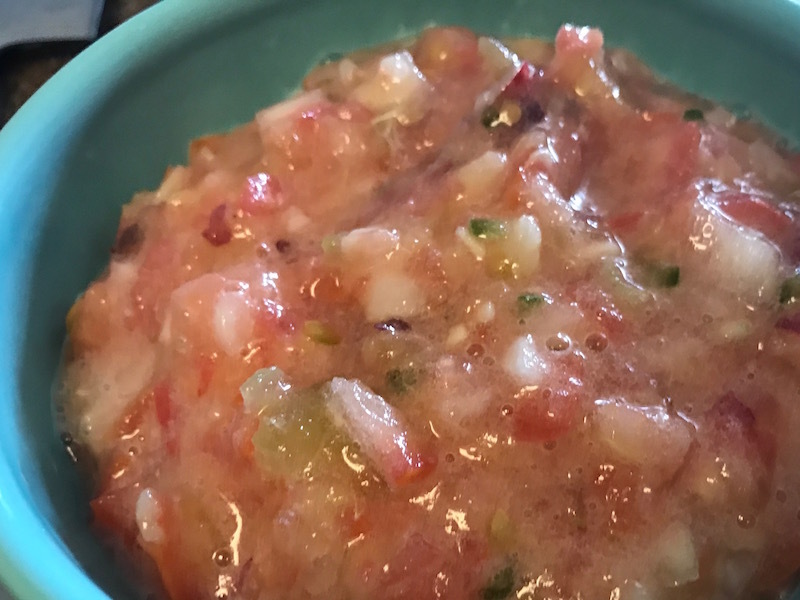 Peach Salsa in Seconds | Keep It Up, David! 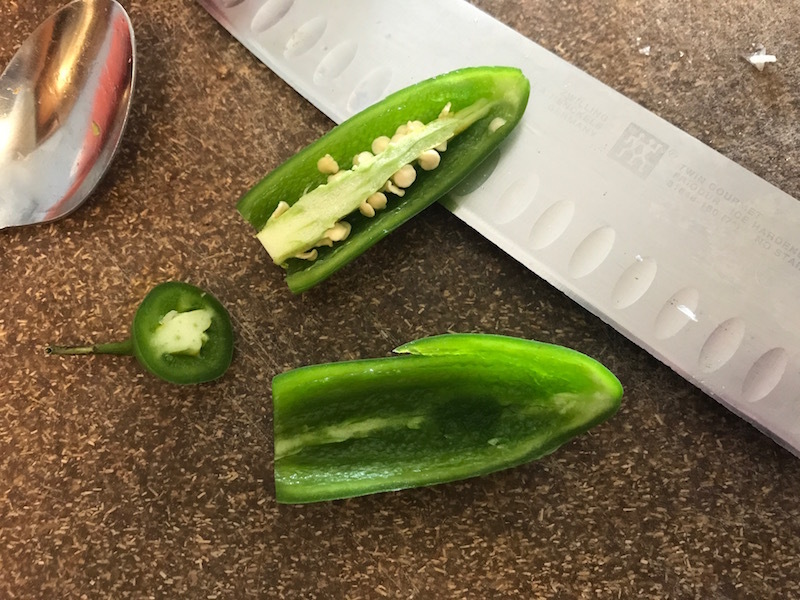 Cut the jalapeno lengthwise. Scrape out the seeds and the white inner ribs, like I did on the bottom jalapeno half. The seeds and the ribs contain a majority of the heat in a jalapeno. You still get some heat and flavor from the green part, but your mouth won’t end up on fire. You Guys! This is my third recipe post in a row! Check out my recipes for Spiced Carrot and Cauliflower Dip and Low-Carb Pancake Roll-ups ! 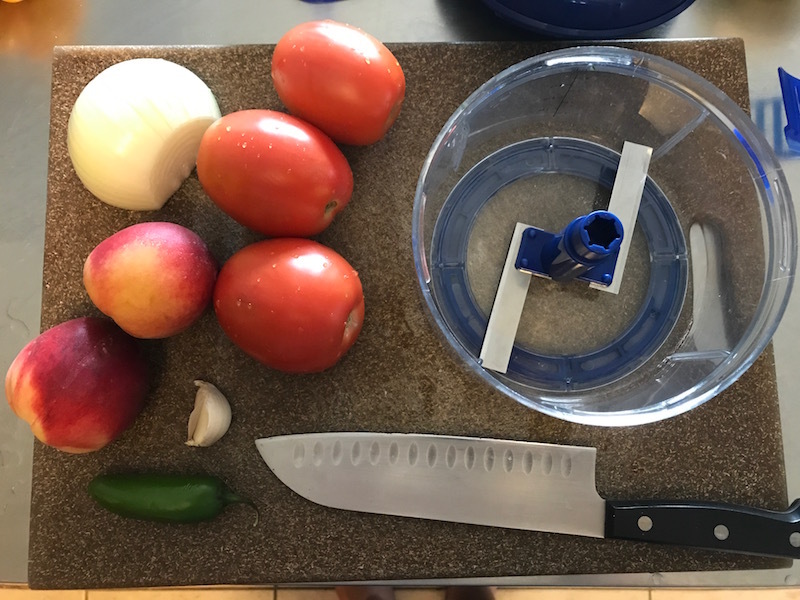 I made the salsa in my Tupperware Quick Chef food processor, which is pretty much a hand-cranked food processor, but you can make it in a regular food processor, too, or, just chop everything by hand, if you have the knife skills and the patience. 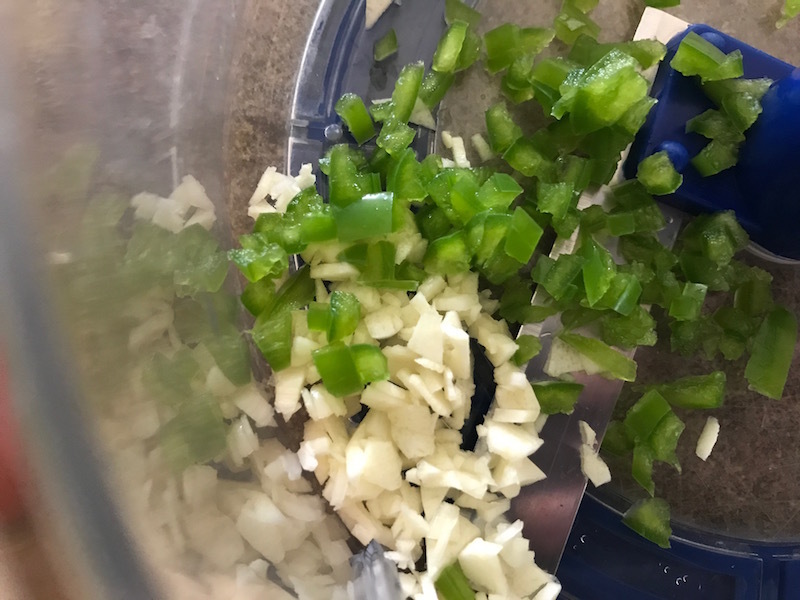 Even though I used my food processor, I still minced my garlic and jalapeno as finely as possible by hand. I didn’t want to risk ending up with huge chunks of either, if they happen to miss contact with the blades. If you use a food processor, I would recommend pulsing it until your desired thickness, so you don’t accidentally end up with soup. It’s on the pale side, but that’s because one of the major ingredients, white peaches, don’t really add any color. It’s super delicious. Sweet and heat and spice and nice. And this is versatile, too! Replace the peach with mango or pineapple. Or leave out the fruit altogether and add more tomatoes. Grill the tomatoes first for a charred taste. Add in cilantro. More or less jalapeno. Red onion instead of white. Who cares? …or be healthier, like I was, and eat it on celery. 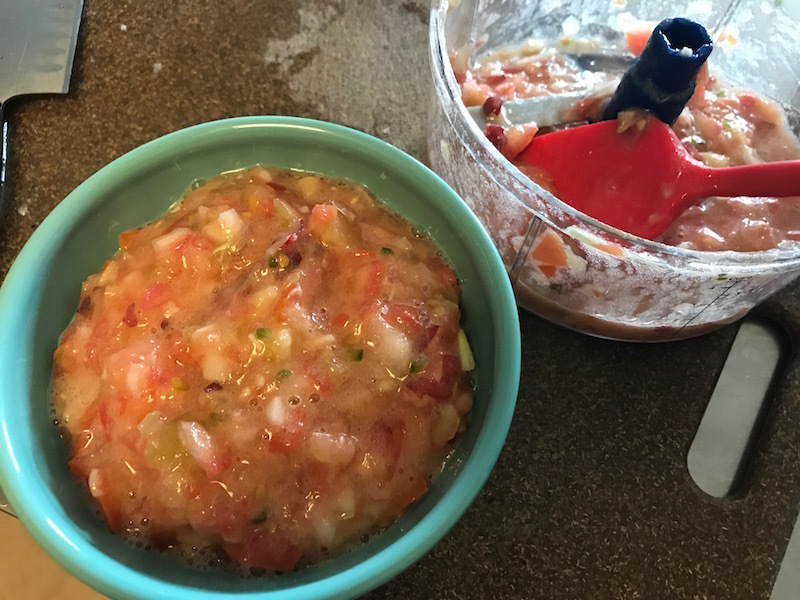 I also love topping salads and eggs with salsa. It’s a very useful condiment! 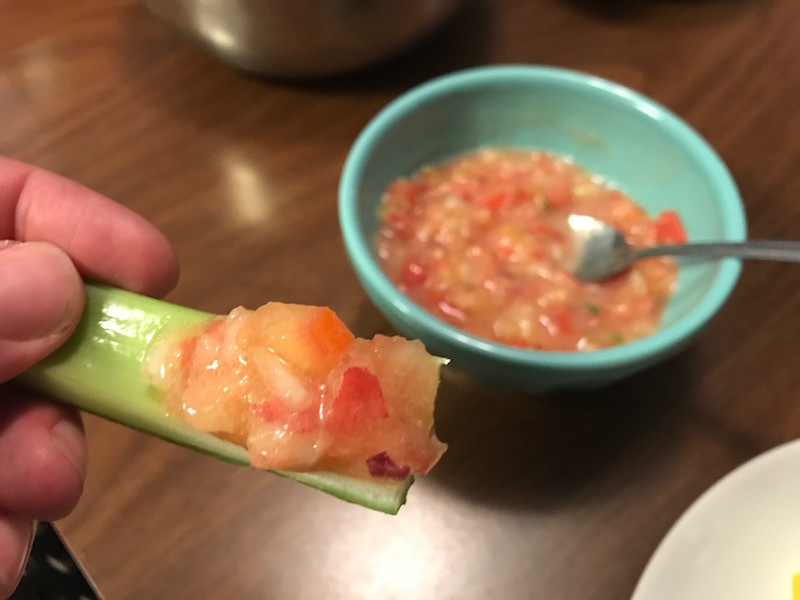 How do you use salsa? More recipes – lots of ’em! – on my Recipes page! This entry was posted on Sunday, June 25th, 2017 at 10:36 pm and is filed under Uncategorized. You can follow any responses to this entry through the RSS 2.0 feed. You can leave a response, or trackback from your own site. 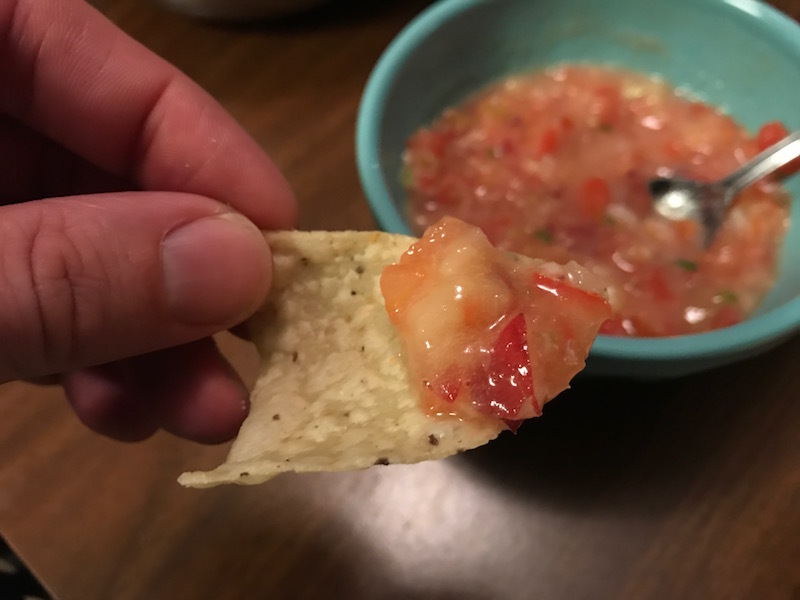 O’ve never tried peach salsa, but it sounds very delicious!